Dean Ross will be here tomorrow, Saturday, January 24, from 10 a.m. - 2 p.m. to sharpen your scissors. The Folsom Quilt & Fiber Guild's annual quilt show is coming up, and we are excited to be a vendor this year! It is held at the Folsom Community Center, 52 Natoma St, Folsom, CA. The dates are Friday, Feb 6 - Sunday, Feb 8. 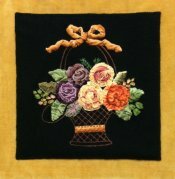 Ribbon Embroidery, Sandra Mollon, Fri, Mar 6, 10:00 a.m. - 4:00 p.m., supply list. Sandra is a very well known and award-winning local quilter, and we are very excited that she's teaching at Thistle Dew. Come and learn ribbon embroidery and embellishment techniques and be able to add another dimension to your work. 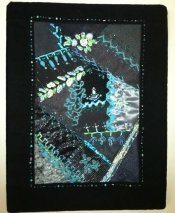 Machine Quilting with Your Walking Foot, Beth Kondoleon, Fri, Mar 27, 10:00 a.m. - 4:00 p.m., $40, supply list. Come join Beth as she shows you how to quilt with your walking foot. You will learn some basics of the walking foot, then move on to do some matchstick and crosshatch quilting. We will explore using some of your decorative stitches along with quilting some curves, circles, and radiating designs. Beth will demonstrate which templates you can use to make life easier. So come join the fun and start quilting those tops!